Shown after the editorial is a selection of 'carte de visite' (or CDV's) mainly from Guernsey. 'Carte de visite' translates from the French as 'visiting card' or 'calling card', It was first used in France by Louis Dodero, though it was subsequently patented by Adolphe Eugene Disderi in 1854. Primarily, they were albumen prints, usually portraits and were mounted on thick card to stop the image being creased. The card usually measured 64mm (2.5 inches) by 100mm (4 inches). The actual photograph varied in size depending on the photographer. The story goes that this method of mounting a photograph on a calling card seemed a bit vulgar and was slow to gain acceptance, but they really took off when Disderi published and marketed Napoleon III image as a CDV in 1859 and the 'well to do' naturally followed suit. Popularity of the CDV eventually encompassed all walks of life, though primarily the middle classes upwards due to the cost. It was a popular new way of giving or sending a likeness, whether of family, friends or famous people. Royalty, actors/actresses, politicians, in fact any celebrity had their photograph taken – these were collected and placed in special albums just like stamps! There was a lot of money to be made, and hence competition from others in the profession; it is known there was also counterfeiting of famous images by unscrupulous photographers to make extra money! The CDV at that time was the only realistic way to send images in the post. Daguerreotypes were very expensive and like ambrotypes were encased behind glass in a bulky protection case. An albumen photograph without a backing being very thin was easy to damage. Tintypes (or ferrotypes) were popular in the USA (invented by Prof. Hamilton Smith of Ohio in 1856 from the ambrotype) , but never really took off in Europe. As far as the author can ascertain, the average price for a personal CDV in the UK was about a shilling (5p) each. If they were printed in quantity by a company and say were of celebrities; five shillings (25p) a dozen. Some cameras had multiple lenses which must have brought the costs down. No matter how cheap this looks to us today, these prices were still very expensive for the average person. Other than the mass produced cards, to go to a photographer and have your image taken like today was not an ever day occurrence. This was a profitable time for photographers in the Channel Islands and elsewhere. 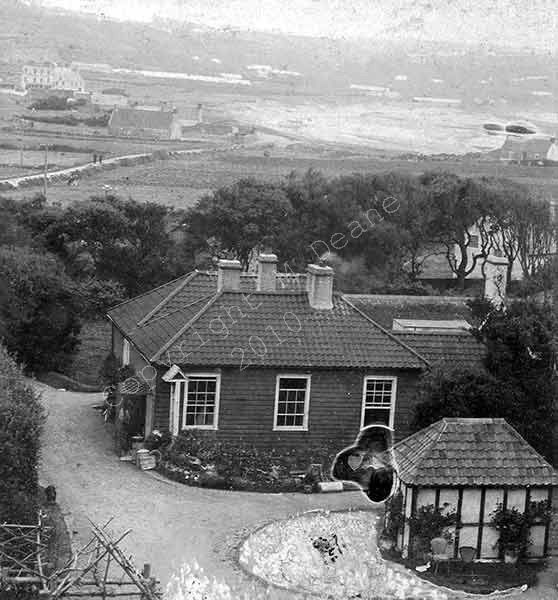 In the early days photographers would come over to Guernsey from France and England to tout for business from the wealthy - many photographers names I am sure are yet to be discovered. Of interest to the historian will be the dating of the photographs and this can be hopefully be done in the future with input from third parties. Most cdv's do not have a negative number for reprints, even though theresometimes pre printed marks on the back for it! The clothing and style of a card may give some indication of date, plus the cards gradually got more sophisticated as expectation from the customer and competition from other photographers got more fierce. The backs of the CDV's if printed, are to some people more interesting than the images themselves, as later on they can be very elaborate and also show an established photographers a time line of their business. With research which third parties can hopefully help with, this will also be a good dating method, due to change of address and name etc. It is therefore important that a record of the back is also made if anyone is recording their own collection. Most images shown here I believe date from the 1860's onwards. For further reading, a very good link on CDV's and old photographs in general is shown here. Most of the carte de visite images shown on the website belong to the author, but some originate from a private collection owned by Roger Finch. I am extremely grateful for his permission to scan these.